Fashion's Night Out, a global fashion celebration, will take place this Friday, from 6-10 pm! Hosted by Vogue and the city's mayor, this annual shopping bash will be celebrated in LA with celebrity appearances, gourmet food trucks, in-store cocktail parties, music, runway shows, and of course, SHOPPING! Over 200 retailers in the Los Angeles area are participating, including Chanel, Juicy Couture, American Apparel, BCBG, Balenciaga, Betsey Johnson, Alexander McQueen and lots more in Los Feliz, Melrose Ave., the Beverly Center, the Grove, Abbot Kinney, Robertson Blvd., Westfield Century City, Westfield Topanga, and West Third Street. Very cool: free buses will be provided to shuttle shoppers to and from each of the participating neighborhoods! 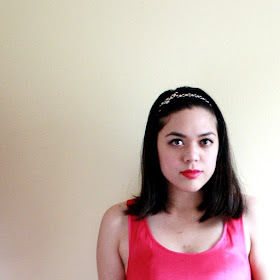 I'll be at the Grove for the first Bloggers' Cafe! See you there, LA lovelies! 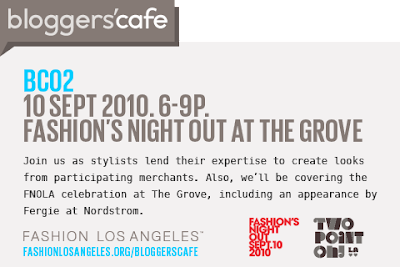 "The night will centre on The Park at The Grove, featuring up to ten wonderful Los Angeles based stylists, including Reah Norman, Kallah Maguire, Bree Cooley, Laurie Brucker and Margaret Sche (and me!) all on hand to lend their styling expertise, and Bloggers' Cafè will be on hand to cover all The Grove's Fashion's Night Out festivities, which includes an appearance from Fergie and the designer behind TOM's shoes at Nordstroms - so much fun and very, very exciting." Not in LA? No problem! FNO is a global event. Check out Fashion's Night Out Elsewhere to see if there's a participating city near you.